The above info came from Kelly, and was edited by yours truly (contact me). The image came from Amazon.com. 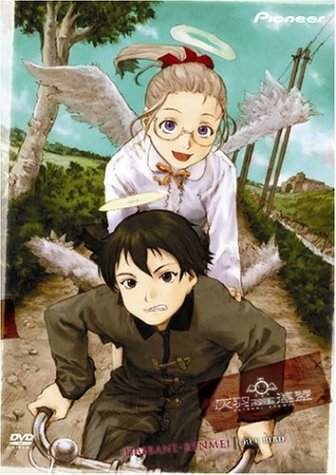 Haibane Renmei is about a forgotten, walled-off town where humans co-exist with the Haibane (charcoal feathers). Rakka had a dream that she was falling from somewhere very high up in the sky. She woke up in a cocoon, and broke through it to find herself laying in a bed. Reki comes up and explains to her that she is a Haibane, and that her wings will grow soon. All the other Haibane are also there, and they give her a name based on what she saw in her dream. Hence, Rakka, which means falling. Rakka doesn't remember anything that happened in her past life, and is now trying to find her place in the Haibane world. Things get pretty complicated. The Haibane that is nicest to her, Kuu, has her "Day Of Flight", which is where Haibane go beyond the walls. Haibane Renmei is a pretty awesome anime, and I recommend it to anyone, but especially those who are trying to find themselves.